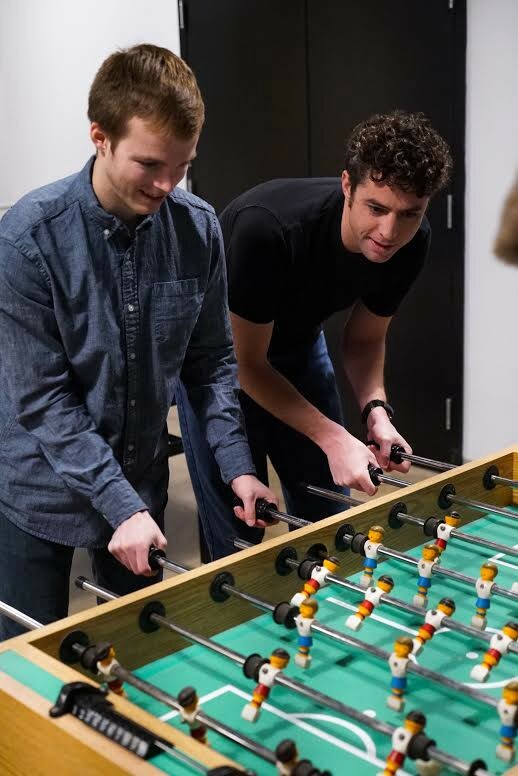 Blake Campbell & Garrett Cooper showing their foosball stuff. A native of the South Hills of Pittsburgh, CEO Garrett Cooper runs the ship here at BenefitMany. As a seasoned executive and product manager, his main goal in starting BenefitMany was “to help the ‘good guys’ — nonprofits, startups and small businesses,” a goal he continues to achieve. Prior to BenefitMany, he and his partners, Blake Campbell and Wes Hays, worked at another tech startup that focused on creating donor analytics for churches and nonprofits. That being said, Garrett knows what he likes. He is someone who has known his passions and hobbies since a very young age, from simple things like his repeated profession of his love for drinking coffee (like Agent Dale Cooper), to more regal things like starting a scholarship award fund to pay homage to a favorite high school teacher, leaving behind a lucrative career in finance to participate in AmeriCorps, and serving as a “Big” in the Big Brothers, Big Sisters program for years. Garrett is 100% a people-person, which is no surprise considering the close attention he pays to our clients, his dedication is unwavering. “If a client needed me to drive their grandmother to the grocery store, I’d do it,” he said once in a meeting. He’s been told, with good reason, that he builds great rapport with customers because he cares about them. “The flip side of this is that it’s really hard for me to sell or get behind something I don’t care about or believe is good,” he says, but if you ask me, that sounds like a pretty stand-up quality to find in a CEO. One of the many things that brings him joy as a business owner is that he can hire people in roles that will help them display their talents. Not only does he feel compelled to help clients, but also to give a platform to his employees for their particular skill sets. “When a team is clicking, it’s a great and productive environment to work in, and coming to work is fun,” he says. Even while he’s hard at work saving the world, he still finds time to continue learning — a passion he shares with much of the BenefitMany team. He has two masters degrees, is a graduate of a software boot camp (Academy Pittsburgh), and has taken innumerable Coursera and Codecademy courses. He is literally always working to better himself in some way. He’s completed over a dozen marathons, some ultra-marathons and triathlons, and likes taking Salsa dance lessons as a way to “be a better husband to my wonderful wife.” What’s not to like about that? With his zeal for continued betterment, he looks up to politician and environmental advocate, Al Gore. Noting his quite public trials and tribulations, Garrett says he admires Gore for his ability to reinvent himself, all the while staying fairly low-key. “Simply put, he just seems like an earnest, interesting, and humble person,” he says of his interest in meeting him someday. Not unlike Gore, Garrett’s passion lies in helping to solve societal problems (e.g., homelessness, addiction, abuse, etc.). He finds excitement in delving into and finding solutions for these extremely complex problems, “knowing how much it will help the individuals and families affected.” Through his work with organizations like Crisis Center North, Garrett continues to use his skills, his connections, and his passion for business and technology in earnest — to see that BenefitMany stays an honorable, reputable, company that’s always working for the good guys.